I love this necklace! Abalone shells are very under rated! This necklace was make with amazing craftsmanship. It has quality shells. It is also made very well! It really is an attention getter! 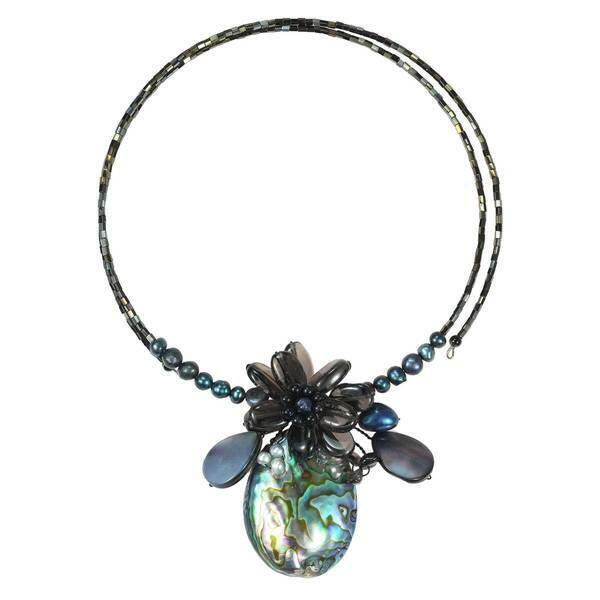 If you like Abalone shells or exotic pieces of jewelry, this necklace is for you! Artisan Lai from Thailand handcrafted this alluring choker style necklace. The design features floral bouquet centerpiece made of quartz, freshwater pearl, crystal and Abalone. The choker band is embellished with crystals and freshwater pearl. All weights and measurements are approximate and may vary slightly from the listed information. Treatment code N (mother of pearl) N (abalone) N (freshwater pearls) E (quartz) CR (crystal). See Treatment Guide for further information. Beautiful necklace with loads of compliments when I wear it. The only drawback is that the 'memory wire' has too much memory. It is a very tight circle around the neck and somewhat uncomfortable and will not relax to a looser circle. Does not lie well on your neck. To match a beautiful pair of earrings I bought earlier on Overstock! !